Great place! The hosts were superb, just the best. Very responsive and they go the extra mile to make your stay perfect. The location couldn’t have been better....walking to everything. We will return to this fabulous city....and we wouldn’t stay anywhere else! It was a unique property centered in the middle of Jerez town. All modern amenities included. Juan the host is wonderful and so helpful and friendly! Everything you need, great location in the old town. Extremely responsive and supportive hosts. Lovingly and tastefully decorated apartment. The interior layout of the apartment was good . All the fittings etc were of a high standard. The shower was an experience and the bed was soooo comfortable. Excellent location. Amelia had baked a traditional cake which was a lovely touch. The rear patio with spa pool and water misters was lovely. The Harley - what can I say??!!! Ice in the freezer on arrival was a real surprise as we had run out. The cake was spot-on! Thank you! Lovely apartment with all modern appliances. Adored the courtside garden and jacuzzi. Very helpful host. Lovely homemade cake left in the apartment for us to enjoy- which was delicious! Can't wait to visit again. You don't rent an appartment from people that just want to make money. They let you live in a real home. It felt like we were actually guests in their own home. This appartment has character. We have let several appartments in Spain, but this one belongs in the top 2. All amenities were available. Everything was first rate. The bed was excellent, location perfect, but also in a quit area. So good nights of sleep. Especially the responsiveness of Juan was outstanding. No effort was too much for him. Also outstanding price/quality. Mucho Gracias! The apartment is on a very central area of Jerez de la Frontera. It is on a very safe zone as well since the Police Station is just next to it. Very quiet area too. You have all the restaurants and bars very closeby as well. For parking the car you have free parking 5 minutes away walking. The host was very friendly and helpful. Even left us a home made baked cake which was delicious .The apartment is incredible, very modern and cool. A wonderful apartment in the center of a wonderful village. We love such places. Super contact with the owner. A fantastic place for people who like to sunbathe (near beaches), visit (many wonderful places) and those who like to go out to the restaurant in the evening with good food and wine. Aprtament has everything that is needed and necessary. I recommend it to everyone! Great location, clean modern apartment, helpful host! Thank you! We had a great stay and will definitely recommend this place! Lock in a great price for Home Apartments Jerez – rated 9.8 by recent guests! 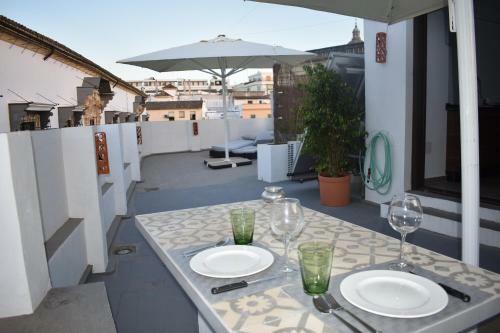 Located within a 5-minute walk of Plaza del Mercado and 1,800 feet of Jerez Cathedral in Jerez de la Frontera, Home Apartments Jerez has accommodations with free WiFi, a seating area, a flat-screen TV and a kitchen. All units come with a dishwasher, oven, a coffee machine, a microwave and electric tea pot. There's a private bathroom with bidet in all units, along with free toiletries and a hair dryer. A grill is available for guests to use at the apartment. Villamarta Theatre is 1.4 miles from Home Apartments Jerez, while Circuito de Jerez is 8 miles away. The nearest airport is Jerez Airport, 8 miles from the property. When would you like to stay at Home Apartments Jerez? This apartment has a dining area, kitchenware and barbecue. This apartment features a tile/marble floor, satellite TV and dining area. Please note that the outdoor hot tub is open from autumn to spring. House Rules Home Apartments Jerez takes special requests – add in the next step! Home Apartments Jerez accepts these cards and reserves the right to temporarily hold an amount prior to arrival. Please note that, due to local regulations, the property might request all guest over 16 years old to provide ID number and personal details in advance. Please note that the outdoor hot tub is closed from October until April. We went in January, it was too cold to use the patio. That means spending time indoor where it is a bit dark. Due to multiple food allergies we have to cook ourselves, which was difficult: there are only two burners and their size is limited, it‘s not possible to use a large pot and a large pan at the same time. But for breakfast or a simple snack it works fine! We have nothing negative to say about the place. I have mentioned above that there are many stairs and that can be a problem for some people, but the photos of the place show them, so there is no surprise there. Our stay in Jerez could not have been more enjoyable this year! We received a lot of help settling in by the owners even though they weren't in Jerez. In fact, they had a book of information on the apartment, how to work things and some tips on the city too. It was very helpful. We always stay at booking.com apartments and I have to say, this was by far the best place that we’ve stayed at. The location is perfect. The apartment is lovely and warm and all the attention to details was most appreciated including “fully” stocking the kitchen and bathrooms and having a dishwasher, washing machine, great A/V, wifi and speakers, comfortable furniture including a very comfy bed and lovely sheets and pillows and a large sectional sofa. The bathtub and shower are fantastic. The terrace is wonderful and the bbq is a really nice addition. The light (lots of windows and the terrace) in the place are wonderful. We felt very much at home, which is a big deal for me. We enjoyed our stay immensely. We had a good parking place nearby that involves a short drive through rather narrow streets for an extra daily charge. It is a short walk and several stairs away. It's on a short street that actually ends in stairs, so you have to really drive on this small street to turn left into the parking lot. This was described well by the owners. A note for those who have trouble with stairs. There are many.. 2 to get to the door and a steep set of 12 stone stairs to get into the apartment. Once inside, to get to the terrace, BBQ, washing machine and shower, you must climb a wooden staircase (I forogt to count the stairs, but I guess that it's about 20). Our 4 night stay here was outstanding. The apartment was probably the best self catering accommodation we have stayed in. The hosts, Juan and Amelia, are wonderful. Lovely people - inviting, warm, friendly, funny. Amelia baked us the most delicious cake for our honeymoon trip. They whatsapped during our stay to make sure we were ok and to recommend places to eat. Location is perfect. Close to some great areas, sights, restaurants and bars yet on a very quiet and safe street. Facilities were first class. Car parking was extremely convenient and the apartment was 10/10. All the amenities you need - cooking utensils, cutlery, cookware, dishware, cooker, oven, coffee machine, microwave, dishwasher, washing machine etc etc. A drawer with basics such as oil, hot sauce etc. The air con was fabulous and much needed! The curved wall mounted tv was brilliant for chilling out after a long day watching free Netflix! A real bonus. The Jacuzzi and outdoor patio area was brilliant. The lighting is romantic and the seating area lovely for drinks. There is a neat air cooling system which is delightful. The decor is modern and clean. Luxurious finishes and materials, nicer than most hotels! Double shower wet room is massive and very impressive. Loads of storage and hanging space. Most comfortable bed I have slept in other than my own. Just perfect.